All of the Langlade County snowmobile trail system is CLOSED for the season. Thank you to all the groomers for making the trails great! 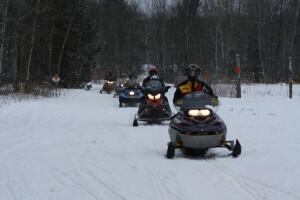 Snowmobile Trails in Langlade County, Wisconsin are developed and maintained by the Langlade County Forestry and Recreation Department, and 10 different snowmobile clubs in Langlade County. There are over 530 miles of state approved and user funded trails. It seems like just as we finish work from the last season, we are starting a new. By starting before the snow, we foster a safe, well-maintained snowmobile trail system throughout the county. The snowmobile clubs help make the sport more enjoyable and safer for everyone! The Langlade County snowmobile clubs are a proud and dedicated group who would like to share their sport with you. As a snowmobiler, you will get a firsthand look at nature’s winter wonderland. Snowmobiling is a fun, healthful recreation for people of all ages. Nearly floating over the snow on a machine is a thrilling experience! Although joining a club isn’t a riding requirement, it is a great way to contribute to the sport. If you would like to join a club, please contact a club representative. Club contacts can be obtained from the Langlade County Forestry Department. The Langlade County Wisconsin Snowmobile Council, organized in 1974, is compromised of delegates of all area snowmobile clubs. Including: Antigo Sno-Drifters, Bryant Ridge Runners, Deerbrook Bridge Runners, Elcho Sno-Devils, Lily Sno-Birds, Northwoods Boulder Lake Snow Goers, 100 Mile Snow Safari, Phlox Winter Knights, Polar Blazers, and Tombstone-Pickerel Sno Club. The Langlade County Forestry and Recreation Department, along with the Council, orchestrates the snowmobile and winter ATV programs for the county. The snowmobile trails that traverse the county are primarily located on private property. Trails flow through highlands, hardwoods, pine forests, low lying bogs filled with spruce and tamarack, and wide-open spaces of frozen lakes and farmer’s fields. The clubs work very hard to obtain and retain these trails. It is imperative that riders stay on marked trails, and respect other people’s property; after all, they are who make it possible for you to ride. Without private landowners, Langlade County’s Trails would be a small fraction of what they are today. Please enjoy the trails, but please use caution as some trail segments may be changed or rerouted. There are also some One Way trails through the Jack Lake area that are a great way to start your first timer on a sled safely. This way you don’t have to be worried about oncoming traffic. Some of the “Old Timers” : ) like that trail too! Langlade County has an aggressive Snowmobile Patrol Program run by the Sheriff’s Department with help from the Wisconsin Department of Natural Resources, which enforces Wisconsin Snowmobile Laws, such as, current registration, intoxicated use of a motorized vehicle, and the 55mph nighttime speed limit. Every year snowmobiler’s can’t wait for the snow to fall, and are sad to see it leave. Langlade County has an excellent reputation on keeping the trails well groomed and marked. We have detailed maps that also include road names and city/town locations; Antigo, of course, being the hub of Langlade County. The map also includes intersection numbers, and pit stop locations, including, gas, food, bars, and hotels. There are also several parking areas marked on the map. We leave the welcome mat out for you! Request your Langlade County Snowmobile Map here. Our lodging offers the rest you need after a long day of hitting the trails. Whether you are looking for woodland cottages, modern motels, or chain hotels, you’ll find it in Langlade County. If you need to satisfy your taste buds, you’ll be able to find everything from fine dining to beer-n-burger joints. Many are located right on the trails. Once the trails are open, we will be frequently updating the trail conditions, so you can be assured an awesome ride! We hope you are as excited as we are to start a new season, and we hope to see you out there! Come find out why Langlade County, Wisconsin is “The County of Trails.” If you have any questions or concerns regarding the snowmobile trails, please contact the Langlade County Forestry and Recreation Department, at 715-627-6300. DRIVE SAFELY AND HAPPY SNOWMOBILING!